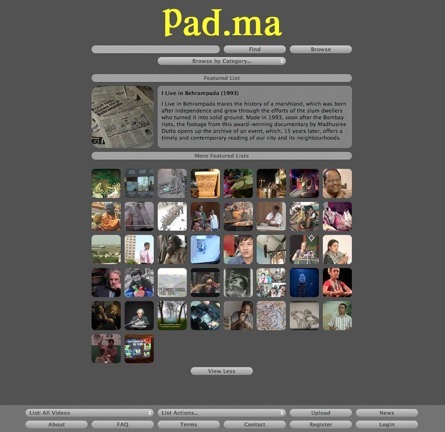 The project consists of an ongoing public access digital media archive of footage and unfinished film available online. The whole collection is searchable, viewable and free to download for non-commercial use, it uses video as a medium of documentation collection, argumentation and exchange. It currently has about 2000 hours of published videos. The majority of material is from Mumbai and Bangalore and it consists of the documentation of changing cityscapes, street and domestic life, commercial and intellectual activity, protests, chance meetings, police raids, train-rides, horse-carriages and other transports, conversations with various community, state and corporate interests, players and agents, artworks, phone taps, audio recordings, "found" footage, etc. Pad.ma is a way to access the images, intentions and effects present in video footage, that have tended to suppress for a log time. This expanded treatment then points to other, political potentials for such material, and leads us into lesser-known territory for video itself. HIVOS. Currently Bohen Foundation and the Foundation for Arts Initiatives. Berlin's 0x2620.org (oil21.org), Bangalore's Alternative Law Forum and three groups from Mumbai: Majlis, Point of View, and ChitrakarKhana/CAMP, website users.